I'm a fan or rice packs. you shove them in the microwave and suddenly leftovers becomes a meal. I've not bought as many recent as i've been trying to cook my own grains, but these were a little different as they contain quinoa. 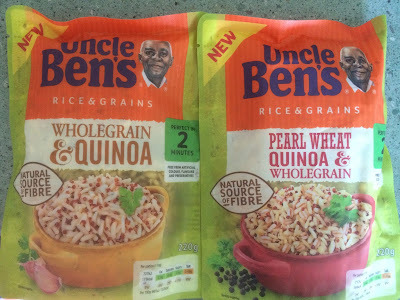 When I picked them up i'd assumed it'd be a 50/50 kind of deal, but it seems that the quinoa is more like 12% of the pack and the rest is a sprinkling of whole grain and the majority is rice. 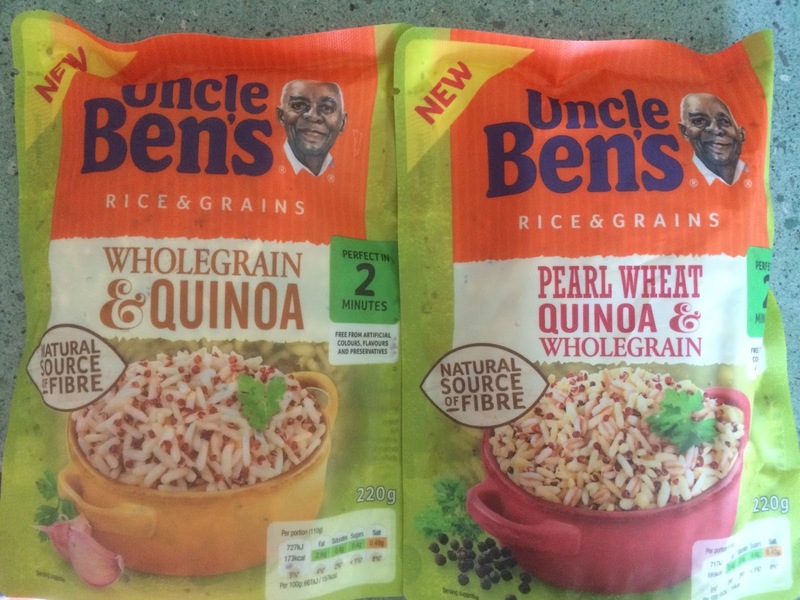 In some ways disappointing, but it's not like they are hiding the fact - Uncle Ben's is most associated with rice (and Spiderman). I heated this up and had it with a large kale salad as part of my Fuhrman 'Eat To Live' diet regime (quick update - I have finished the book and started the 6 week trial - and I've already lost a pound or so and started to get odd withdrawal symptoms I wasn't expecting due to the lack of sugar and animal products). I thought it worked well, my partner wasn't so keen. I understand the choice to keep the texture more similar to a rice pouch as the rougher quinoa and wholegrain mix may not be to everyones taste. The taste was very natural and they haven't started to add their usual flavours to this - which in a way I like. My favourite rice pouch is the coconut Thai one, but that doesn't go with everything! I'm not sure I'll be rushing out to buy these - in these proportions it's most of my 'bad calories' for the day where as if I knock up my own quinoa its none - but it's a good addition to the range and something I'll recommend and maybe have as a sneaky treat lunch once in a while.